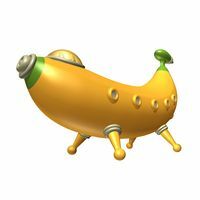 The Banana Spaceship is a vehicle in the game DK: Jungle Climber. It appears in the level Cliffy Peak. 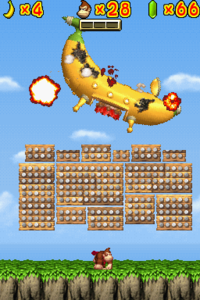 This is exploited in the game, as Donkey Kong mistakes it for a large banana and knocks it from the sky in an attempt to eat it. However, the spaceship fights back by shooting missiles that resemble carrots. The only way to defeat it is by bashing the bottom of it, causing a large button to emerge. Donkey Kong must hit the button in order to damage the ship, which is piloted by Xananab and appears to be powered by the Crystal Banana. It was apparently built on Planet Plantaen. At the end of the game, the Kongs use a Banana Spaceship to go back home. This page was last edited on September 23, 2018, at 10:14.